Raising awareness for a cause is great. Doing something about it is even better. JLL members pride themselves on doing both. Recently, we initiated a rain garden project under JLL’s Girls + STEM Committee, an Issue-Based Community Impact (IBCI) program. 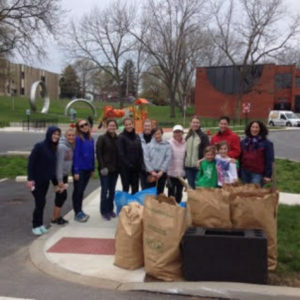 The genesis of the rain garden project started a couple years ago when JLL actives did their first rain garden and park cleanup at Brandon Park, a green infrastructure demonstration project by The City of Lancaster. The City of Lancaster completed a 25-year plan back in 2011. Since then, The City of Lancaster has been pioneering creative ways to reduce storm water from entering the sewer system. Brandon Park was one of those ways. A retrofit of Brandon Park was completed in the fall of 2012. The park combines permeable surfaces in the playground and basketball court areas with a natural sloping topography leading into bio retention areas (rain gardens) scattered throughout the park. The improvements mean that 3.5 million gallons of storm water have been removed from the City’s sewer system annually. Why is this important? Lancaster has a combined sewer system, a CSS, which means that sewage and stormwater all flow through the same pipes. Lancaster’s system, like many city systems built in the 1800s , is old and undersized for the City’s growing population. When it rains, particularly a big storm event, the storm water rushes into the sewage system at a rate that overloads the bacteria that treat (eat) the incoming sewage. The waste water treatment plant simply cannot handle the extra volume of water passing through its pipes. Rather than sacrifice the bugs that live off the waste, the City opens the outfalls and allows the combined sewer and storm water to pass through untreated which is called a combined sewer overflow (CSOs). Before waste water treatment plants were built, dilution was the solution for “treating” waste. That practice was long ago abandoned due to health hazards . In order to solve the problem created by CSOs, the City hopes to reduce the amount of storm water going into the system by about 750,000,000 gallons by 2030. That’s a lot of storm water and to do so the City is going to need a little help from its friends. Learn more about opportunities to help with the rain garden projects and how to join the Junior League of Lancaster on Facebook or the Junior League of Lancaster website.